We talk to Wally from Mama’s BBQ Chicken and Salad Bar and the process he has used with Facebook Live videos to turn his business around. The Chicken Shop wasn’t doing too well, some weeks needing to put money in to keep it running. This is a problem that far too many Restaurant owners are all too familiar with. To try and turn things around, Wally started doing some Facebook Live videos. More people started watching and he started dancing on the videos. Over time his followers built up and he now has over 2,000,000 views for his videos. He has been featured on TV multiple times and dramatically turned around his business. He has grabbed the slogan ‘Flavour, flavour, flavour,’ after mentioning it in one of his videos and seeing the reaction that people have had with it. No script – just Wally’s passion for his food, his business, and his customers. These and Wally’s epic dancing skills 🙂 have created content that have gone viral with very little marketing spend. Very few of the videos are boosted, which is a testament to his passion and how he has tapped into what people want to see. His videos have even been made into a rap song by one of his fans! The effect on the business has been massive. He has turned around a business that was late on making payments to tripling revenue and being a lot more successful. This is a powerful story about how your passion can really be the big difference in your Restaurant when you match it up with technology like Facebook Live. JAMES ELING: Hey everyone, welcome back! 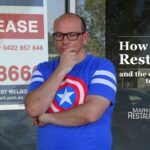 We’ve covered how to do a restaurant rescue in the last two podcasts. Let’s amp it up a little bit. Let’s come up with something a little bit more positive. Today I’m really excited to be interviewing Wally from Mama’s BBQ Chicken and Salad Bar. He’s actually pretty close to where I live and I’ve eaten there before it is pretty damn good chicken. I find this podcast really interesting and inspirational. Wally shares his story with us. He went to a special school, running a business has been tough for him. He’s got a couple of things going for him now: 1.) His whole family is really passionate about cooking great chicken, and 2.) He’s got some pretty unique dance moves and he’s able to put those things together to have a story that is really quite unique. His biggest Facebook video to really get that story out there and he’s had a massive following with that. Before we go on about that, though, if you are looking to doing Facebook, this is one of the reasons why you should be looking at Facebook. I don’t think everyone’s going to be able to come up with a video that is going to be seen or videos that’s been seen a million times on Facebook but there are a lot of restaurants who are out there who are doing really good work carving it up with Facebook ads. If you’re looking at running your first Facebook ad or if you’ve run a few ads and they haven’t really worked for you, maybe have a look at the Marketing4Restaurants website. We’ve now got a University. We’ve got now our first course live which is the “How to run your first Facebook ad”. So, a really important course it’s about 2 hours’ worth of video in there. We talk about why Facebook – the kind of posts you can put up, the kind of posts that you should use for your first ads. And there’s actually one part, where I just go through all of the options in doing an ad, step by step. I’ve designed it so that you can open up the screen have it there and step by step go through and create that ad. This is what it’s fundamentally designed to do is so that you can get in there. Then we talk about budgeting: how much money should spend on the ad and then we finish off with how you should actually work out how good the ad is. I think we’ve covered off on a lot of the kind of things that we would use in running a basic Facebook ad there. This would help to run an ad that has got a really good chance of bringing in some more customers in through the door. It’s a really exciting development! I know there’s so many customers out there who have been asking for us to be able to provide this sort of service. Because my thing is, I really think you’re much better off running your own Facebook ads than getting someone else to do it. We run it for a lot of businesses, this is about helping you to be able to tell your story. James: Now, let’s get in to our interview with Wally. Here he is. Wally, you’ve had some amazing results with Facebook videos up to and including being on TV. How many times have you been on TV? Wally: Twice. First one was on the Sunday Morning Show and on the Morning Show on a weekday, which was the quick one. It’s unbelievable. It started off, pretty quiet, not quiet, not quiet. it was quiet, it was quiet. It was more just like scraping in. And some days, some weeks, we’re putting money in our own pockets, the takes, the bills and wages, and stuff then we decided to start our own videos. James: What’s your story then? How long have you been doing this? Is this your first chicken shop? Wally: No, so when I finished school. Which was special school so my reading and writing are a little bit lower level than most people. So, my parents have always had a take away shop, then they got into a liquor store which was mine and they helped me out and stuff. And then we sold that and we bought a chicken shop in and then from that shop, we’ve been there for about three years. And then the last year just before Christmas, the shop burned down. Wally: Yeah, it burnt down and the landlord was under insured, building insurance so the insurance paid him and helped him out which was nothing. To rebuild the shop, he wasn’t insured enough for it. So, we were waiting for six months with him to see what he wanted to do and he couldn’t afford to rebuild the business. I was insured for my equipment but I was not for the loss of earnings. So, at this stage I was looking around for businesses because I had a loan as well so I was paying the loan and working to see people here and there just to cut the payments on the loan and stuff. Then I found this shop in Endeavour Hills. And from that I went into this Endeavour Hills Mama’s BBQ Chicken and Salad Bar. I bought it rundown, changed a few things inside the shop, cleaned it up a bit, changed everything to my standards. The chickens, I get them from the sellers they were all different I didn’t know how I did it. I built it up but it wasn’t enough. As I started all up in the chicken business of being what–around 7 years? My parents have been doing chicken for about 30 years now. It’s been almost a year since I started doing the Facebook videos and I noticed that everyone, well, I’ve done balloons on the roof, I’ve done pale foot drop, I’ve done advertising with local papers and stuff and none of them really worked so I started then doing the Facebook videos. I’m noticing the people are always on Facebook. Yes, they’re always on social media, on their phones and stuff. I first started my luck filming myself eating the food. I started noticing there were people watching it and coming in from it. I started doing specials and then they got more into it and I started dancing. And once I started noticing I was saying to my parents, “Look at this, I’m getting more attraction on me dancing.” So, I started dancing a bit more, getting in from the old-school days when I used to go out with all the boys and stuff. I started rocking it and stuff, then yeah, it went big straight away. It was a blessing, it’s a blessing. James: That’s fantastic, isn’t it? So, what’s the biggest reach that you’ve had with one of your videos then? Wally: One video on its own, I think, is up to 900,000 views. Wally: That’s with no boosting. Wally: Overall, what we do with each video is we collate it. Every video it corners it 2 mill easy of every video if you count the whole. One video it’s too corny I’ll get notifications for that same video they keep commenting on it, “Look at him, what a king. Look at the king. He’s putting Endeavor Hills on the map. What a legend.” Everyone that’s coming in they’re all happy with the food. The chickens are juicy, it’s not dry. They’re all happy with the customer service and I think that’s number one–customer service. When they do come in, I can see in their faces they want, they come in I just want to say it, “Flavour, flavour, flavor.” So, then I’d start dancing with them, I give them a dance or give them a stare or we’ll have a solo together. There it’s unbelievable, it’s unbelievable. James: That’s fantastic, isn’t it? So, where did the idea for “Flavour, flavour, flavour” come from then? Wally: It was while I was sitting down eating a souvlaki, and I noticed the flavours coming out of the souvlaki and then I noticed that the attraction on that video people now know as Flavour. They said, “Give me some flavour.” So I started mentioning it a little bit more like, “Flavour, flavour, flavour.” And then one of my boys created the Mydaddy video. I think he’s from Adelaide on that Sound Cloud he made like a techno music with my voice. Every year, from every video he’ll pull out, “Flavour, flavour, flavour, flavour, flavour.” Yeah, I just kept on with it. It was catchy, it was catching everyone. Everyone that comes in, every single person from Facebook has come in or not Facebook and have heard about us. They say, “Mama’s BBQ Chicken and Salad Bar 51 Heatherton Road Endeavor Hills. Flavour, flavour, flavour.” So, I feel like I’ve trusted people to that, it drilled into their heads the name of the shop, the address, and the line, Flavour, flavour, flavour. James: It’s interesting. I was talking to some people in the office and I said to them I’m going to interview this guy he’s got these videos, Flavour, flavour, flavour. That was the thing that they picked up on. You really grabbed that, now you own those three words, which is epic isn’t it? Wally: Yes, yes, that’s right. I’ve got people they come in. In fact, there’s this one lady whose husband goes to me, “What are we having for dinner tonight?” And he goes well, “Flavour, flavour, flavour.” She just laughed and he’s even got you saying it. James: Yeah, it is amazing just that the reach is really phenomenal. How do you go through filming them? So, what do you do? How? Wally: On the spot, pretty much. So I walk in the morning and I say to my dad, “I want to do a video today, lets push this product.” My dad normally does all the filming and he’ll look at it. We don’t have a script or anything and say off the top of my head. Yeah, it comes out naturally in everything we do. I don’t plan anything in my videos I don’t do nothing like that, it just comes out. James: And I think that’s part of the raw appeal is the fact you can see it’s you talking. It’s not a slick script, it’s not well-produced. It’s your passion for your business and for the third that’s the bit that comes out. I think that’s part of the natural attraction to it. Wally: Yeah, because I try. James: What sort of videos do you find go best? Wally: Well, they are all sort of very similar in the videos but I reckon there’s not really the best one. Me, personally, the one that has hit the most views. I like it but I think I’ve got better videos out there that probably the people haven’t seen yet or have seen it but not everyone has. I like the videos where, yeah, I’m dancing but it was I’m around showing my food because my passion is on the food. I’m just cooking the food seeing someone eating the food and smiling and saying to themselves I haven’t had chicken like this for over 30, 40 years. You can’t find chicken shops nowadays that are still juicy chicken–it’s all dry and stuff. When I do a video with the food and dancing together, that’s what I like the best. James: So, what’s your secret with flavour, flavour, flavour chicken then? What makes the chicken so good? I agree, our local chicken shop which isn’t too far from you we don’t eat chicken and chips that much just because of the fact that they’re often pretty dry. Wally: Yeah, well, I learned this from my parents, the recipe, the way we cook the chickens. So, it’s all in the family, generations even on our days-off, Dad’s cooking a BBQ still. It’s in our blood. We love cooking and that’s where the flavour comes from. That’s where it’s juicy and the way you cook it. What sort of effect have the videos had on your business? Wally: Well, pretty much it’s tripled. It helped the business a lot. It helped everything lots. I was behind in payments. me I was desperate coming back for payments there’ll be all sorts of stuff. Now, we’re not stressing on how are we going to pay this, how I’m going to pay that. It helped a lot. Everyone that keeps coming in, they keep coming back that’s what I’m grateful for because they’re coming back because they enjoy the food. It helped a lot. James: That’s awesome. I’m a big believer that great marketing will only go so far because it costs a lot of money to get someone to come in and you’ll never going to make that money back unless they come back a second time, third, 99% of restaurants. You ‘ve got to have great food. Wally: Let’s see now, they will try it, then they come back the more I reckon I’ve seen people come back four or five times now and they keep coming back. The people from this weekend just passed, people from Geelong, people from Adelaide. Sorry, yeah from Adelaide. I had this weekend on it about 40 to 50 people I reckon from Adelaide bit of luck they come down for a racing. Yeah, there was a lot of people from Adelaide been watching. Anyway, Everywhere, it’s gone crazy, people from overseas. James: That is epic. So, you’ve been on TV a couple of times, what was that like? Wally: Yeah, been on TV, Sunrise, the Sunday show. I was on the Sunrise channel 7 and I was on a weekday one as well on the Sunrise so twice. I have been on a few radio stations as well. It’s unbelievable, I can’t thank God enough. James: It’s epic. I think it’s a really inspirational story for someone. Really, the only thing they’ve got going for them is a passion for food and a passion for their business and a really awesome way of telling it. Now, like, you’ve been on TV a couple of times. That’s just crazy, isn’t it? Wally: It’s unbelievable. You don’t get that opportunity in life and I’m grateful that I’ve had that opportunity in life. Who has that on channel 7 Sunrise and it’s unbelievable. Even having that opportunity on TV. It was massive, massive help. James: Did you get a big spike in visitors after being on TV? James: Epic, Epic. Because from a public relations’ point of view, that’s probably fifty thousand dollars’ worth of public relations being on a TV show like that. James: You’re like a chicken and chip shop, they can’t afford anywhere near kind of money they spend. That’s probably the wrong question. Do you boost many of the posts? Wally: At the start, I did. Now, I don’t really boost them. If I’m running a special or I’m running a competition or something I’ll boost them. But no, I haven’t boosted. I’ve maybe boosted maybe five times. James: That’s not a lot at all, is it? It’s just really the viral effect of those epic videos and your epic dancing skills. Wally: Yeah, I think you know I’m happy. I’m always happy, I enjoy it, I enjoy doing the videos. Seeing a big, big boy like myself dancing around like that people freak. Yeah, looking at stuff say it. James: But that’s the thing: I think that’s what the secret is. That’s what’s unique and if you were doing what everyone else was doing then it wouldn’t be unique and no one would take any notice, the fact that you’re out there. A lot of people don’t have the guts to actually put themselves out there. Wally: That’s another thing everyone tells me, “At this time don’t do it, Wally. Don’t put yourself out there on social media.” I say to them, “Look I don’t care what anyone thinks. I just want to build my business and want to put a smile on people’s faces.” I love it when people are running comments like, “Ha, ha! Look at this crazy [person]. He makes my day. I look forward to watching his videos.” I look at a couple of other comments, bad comments. These people commenting bad stuff? I think they’re just jealous. You bet, I want to see people achieve something in life. They want to be miserable all their life. Well, not me. I’m not here to be miserable. I’m here to be happy and enjoy life. James: That’s it, mate, I think that you’re a big, friendly guy who cooks a really mean chicken and that comes through in the videos because you’re authentic and it’s hard to feel like that. Wally: That’s right! You’re not going to find another Flavour, flavour, flavour dancing in your arms like a chicken! James: Yeah, yeah. Exactly like a chicken. Alright, Wally, thanks so much for the interview. I think that this is a really, really powerful story because it just really highlights the power of Facebook. When you nail those things, when you’ve got great food and you find a way that you can tell that story that resonates with people. Next thing you know you’re on national TV and you’re tripling your revenue and that’s a really powerful story I know. So, thanks so much for sharing it. Wally: No problem. You’re welcome. James: What an epic story. I just love Wally’s story. It’s a chicken and chips shop that has been on TV twice. 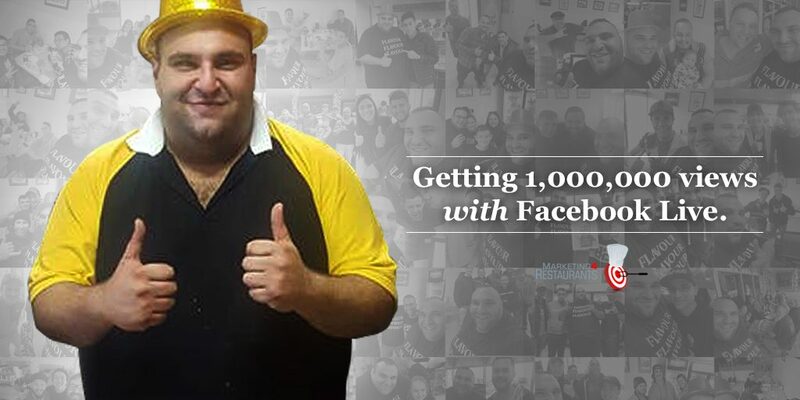 His Facebook videos have had, well over a million views in total and he’s tripled the revenue of the business. We’re talking about a fundamental difference in people’s life. I think that this is the power that technology brings to the small restaurant owner. He’s not Red Rooster. He’s not McDonald’s. He’s not KFC, he’s not any of the big guys. This is just a really nice guy who is being himself on Facebook, that’s what people want to see. So, have a think about that I think if Wally can do it, it really does point the way for so many people out there to really start thinking about the story they want to tell and using Facebook to be able to do it. Yeah, go out, create your first Facebook video. Tag us in the post I’d love to see how it goes. I’d love to see the kind of work that you’re doing and the kind of results that you get back. Remember, as Wally said, it started out slow but it grew and grew and grew. And he’s not boosting those posts, this is just pure flavour, flavour, flavour. So, have a look at the videos. Alright, now, check out the show notes. I’ll have a link to a few of those videos there just so you can get the kind of idea of what it is that he’s doing. They’re raw, this is the jewel in the crown kind of video that you’d want people can see that it’s raw it’s real Wally, it’s real flavour, flavour, flavour. It’s real Mama’s BBQ Chicken and Salad Bar. Yeah, have a look and do a Facebook video. Bye. If you learnt something from this podcast, please share it to help us spread the word to other Restaurant Owners.